Wine Staging is a Wine version which provides bug fixes and features that aren't yet available in regular Wine versions. 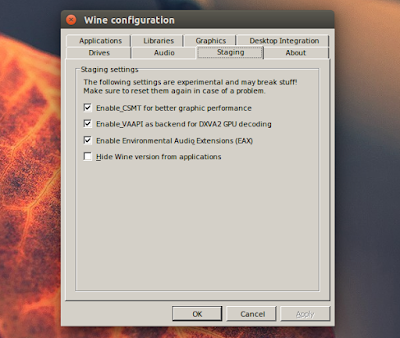 Wine Staging (formerly known as Wine Compholio) was initially created for Pipelight, a project that brings Silverlight and other Windows-only plugins to Linux web browsers. The project has evolved and some Linux distributions, like Fedora, provide it in the official repositories instead of the regular Wine version. For a complete list, see the Wine Staging GitHub page. For more information, see the Wine Staging Usage page. The Wine Staging developers provide binaries for Arch Linux, Debian, Gentoo, Mageia and OpenSUSE - for installation instructions, see THIS page.